What’s the three magic words everyone wants their colleague to say to them? Something like You’re doing amazing would be great. Want a coffee, perhaps? I love you, maybe? Well, no. They’re not the best. In fact, the best three words a colleague can say to you, while facing you slowly with a twinkle in their eye and a hunger in their heart, is simply... Fancy some pizza? And when that magical moment happens, and it will happen, you need to know the best places in London to order a slice of the action to your workplace. 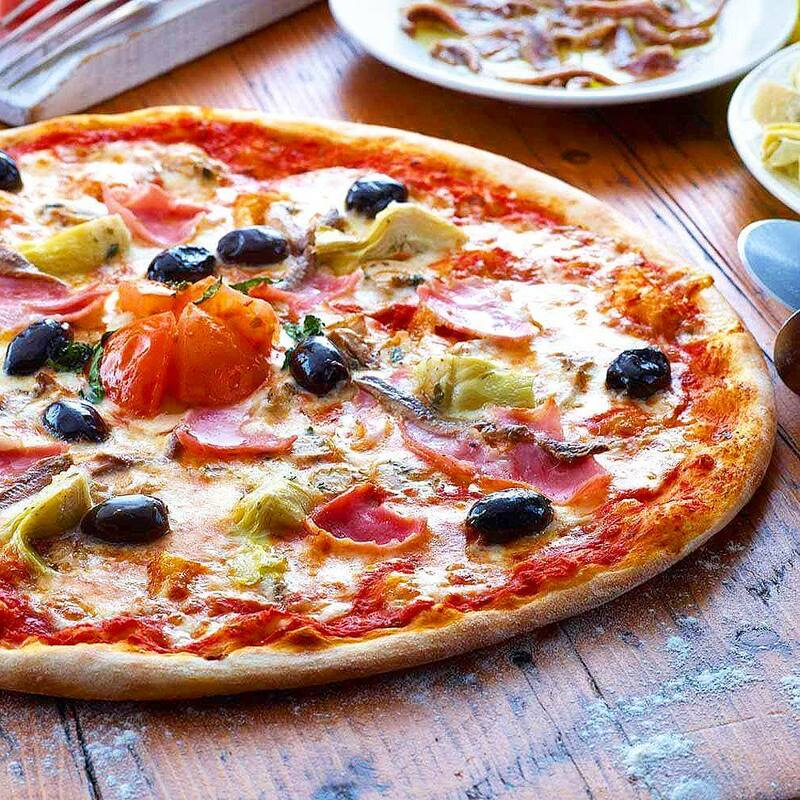 From the traditional Neapolitan to New York-style slices and twists-on-the-classics mavericks, these are the perfect places in London to get pizza delivery straight to your office through City Pantry. Homeslice is your not standard pizza place. Of course, they do a mean Margherita - perfectly salty and with just-right base to sauce ratio - but the menu here features toppings like kimchi, porcini cream and basil. Aubergine, cauliflower cheese, spinach, and harissa. Chorizo, corn and coriander. The kind of toppings that wouldn't get a green light in Naples, but that doesn't mean they don't taste delicious. And it isn't just the toppings that stretch the rules of Italian pizza. That's because every one of their gourmet pizzas comes on a huge 20-inch base. Yes, that wasn't a typo. Twenty. 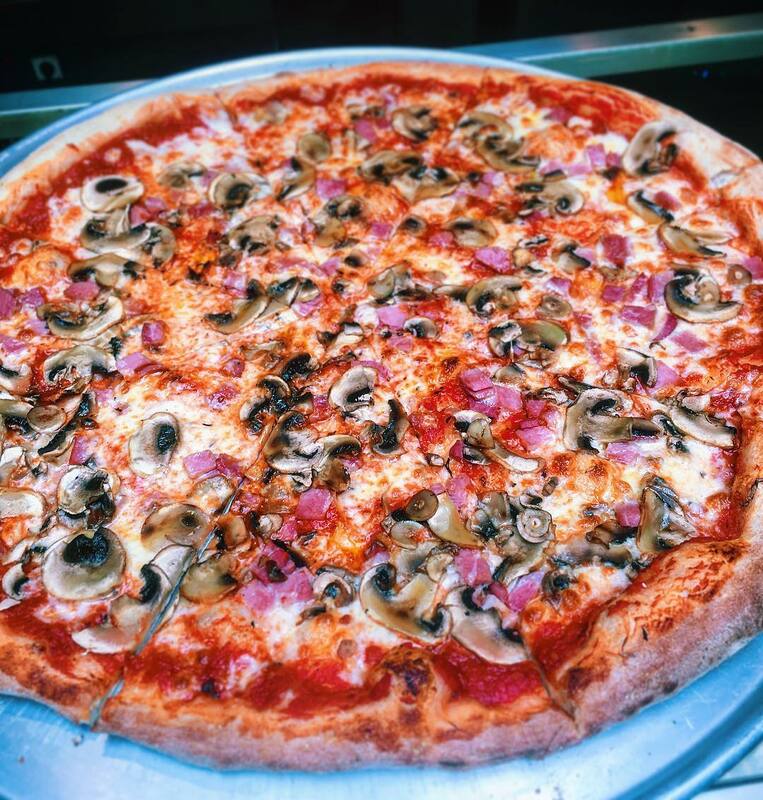 So if you're big on pizza, pizza doesn't come much bigger than at Homeslice. If you're after a truly authentic Neapolitan pie, these are your guys. Brothers James and Thom Eliot, the duo behind Pizza Pilgrims, learned the tricks of their trade over the course of a six-week tour of Southern Italy, which they did in a tiny Piaggio van. A kind of pizza pilgrimage, if you will. 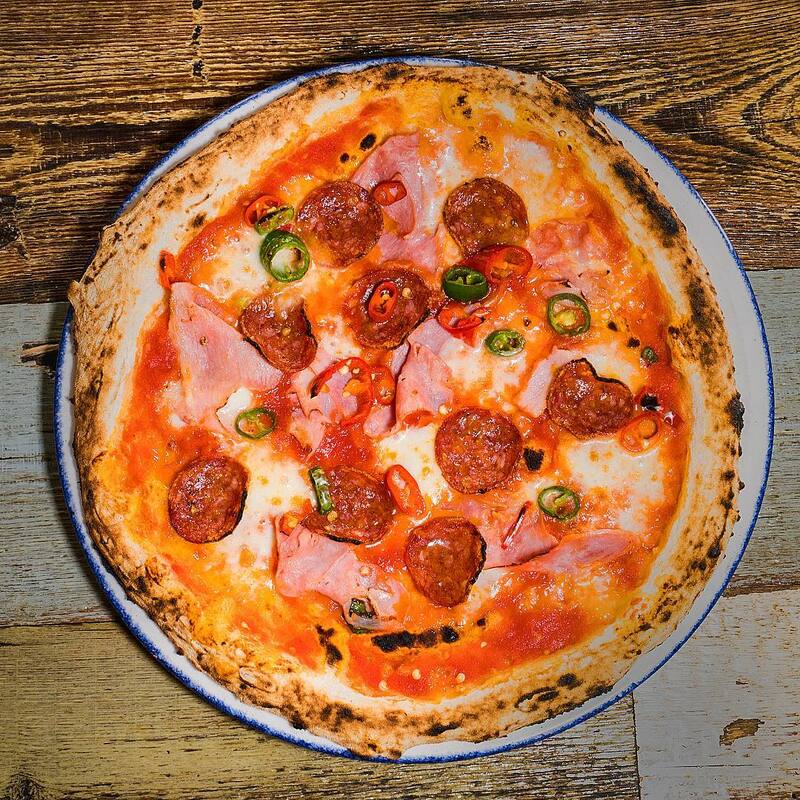 Since then, Pizza Pilgrims have come to specialise in the Neapolitan style, delivering a short menu with big crusts and even bigger flavours - just as it should be. 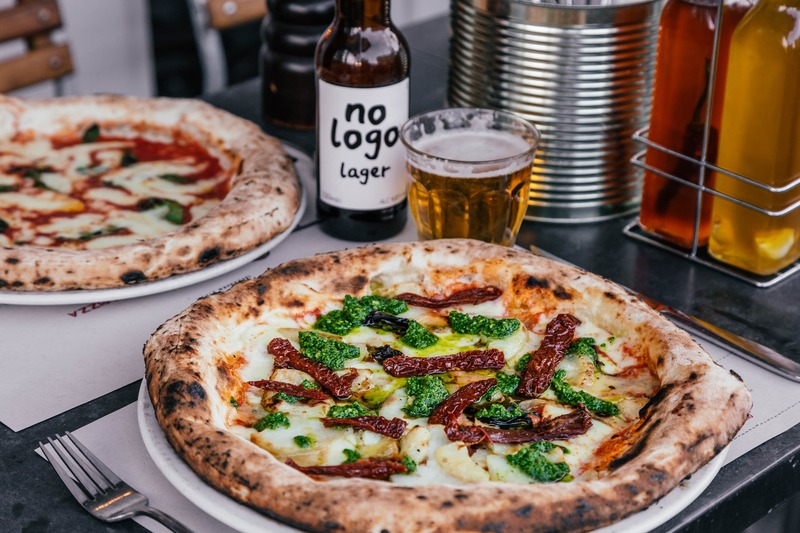 Wood-fired sourdough pizzas with serious artisan credentials guarantee queues at Franco Manca – no wonder this cult-status mini chain has spread across London so quickly. 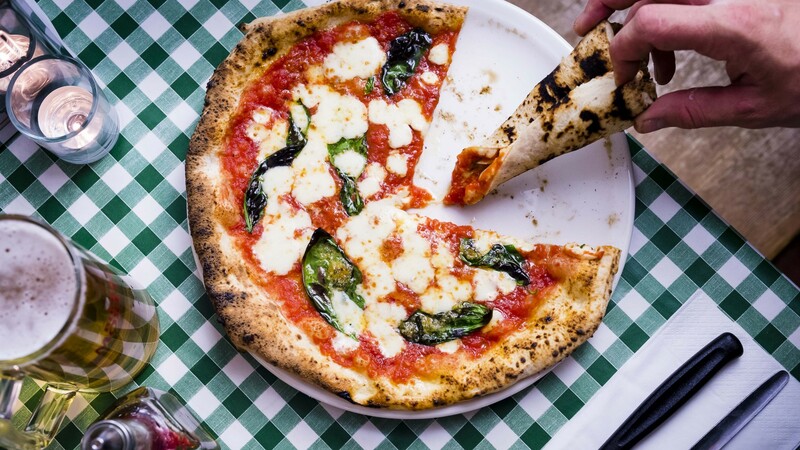 With its top-notch Neapolitan-style pizza, flavourful slow-rise sourdough crust and a variety of traditional and innovative toppings, Franco Manca is one of the best pizza joints in London. And probably beyond. The atmosphere is impeccably hip. The portions are seriously gigantic. And the menu is downright wacky. 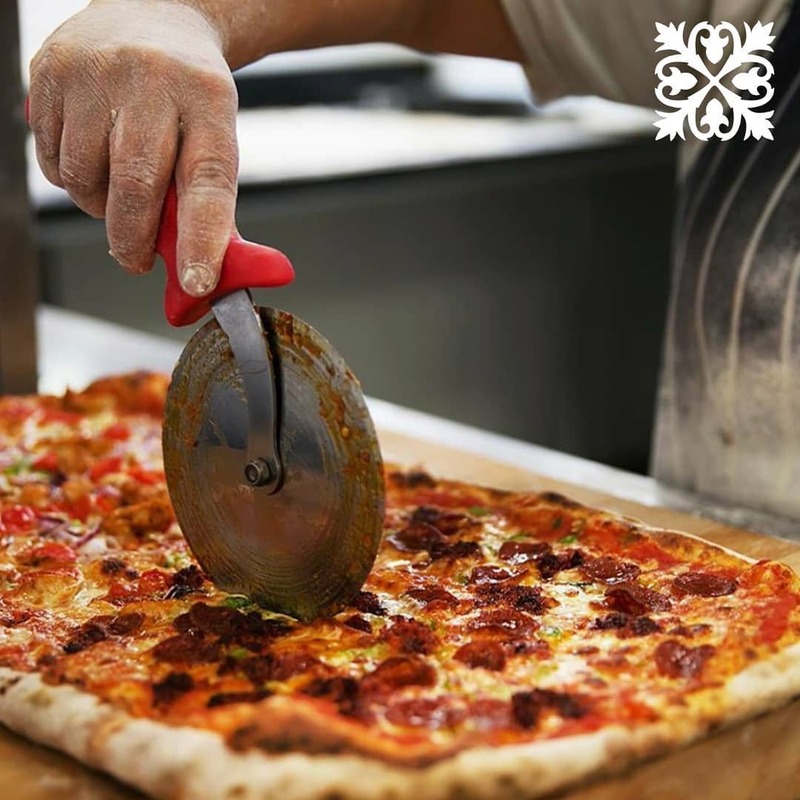 Serving 22-inch New York-style pizzas into the early hours, Voodoo Ray's is either already your favourite pizza joint, or it's about to be. And the most impressive thing about Voodoo Ray's? They've managed to create a vegan pizza that's genuinely delicious. It's called the Queen Vegan - topped with artichoke hearts, green olives, tomato sauce and basil pesto - and you simply need it in your life. Then in your office. And then in your mouth. It turns out you can reinvent the wheel, thanks to the geniuses at Radio Alice Pizzeria. 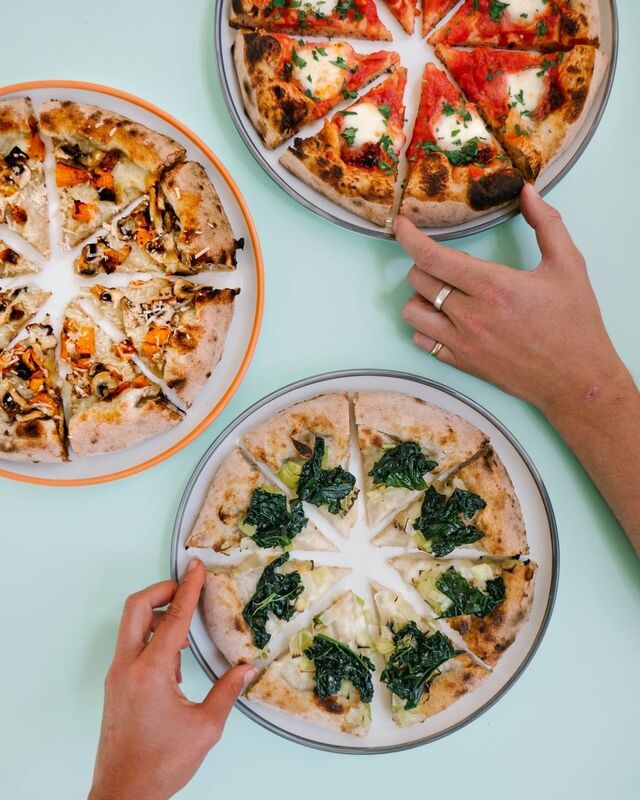 Their pizzas are made using a unique organic stoneground flour, natural 'mother' yeast, then rested for 24 hours and topped with only the freshest, most seasonal ingredients. So what does this all mean, we hear you ask? Well, it means you're left with a pizza slice that's airy, delicious and tastes like nothing else you've come across before. Every last one of Firezza's pizzas probably deserves a taste, but if you're looking for just one to try first? Get your mouth around the Piccante. With spicy and soft Calabrian sausage, Gyulai pepperoni, fresh basil and red chilli with tomato and mozzarella, this is the perfect rainy day treat to order when you're stuck in the office. 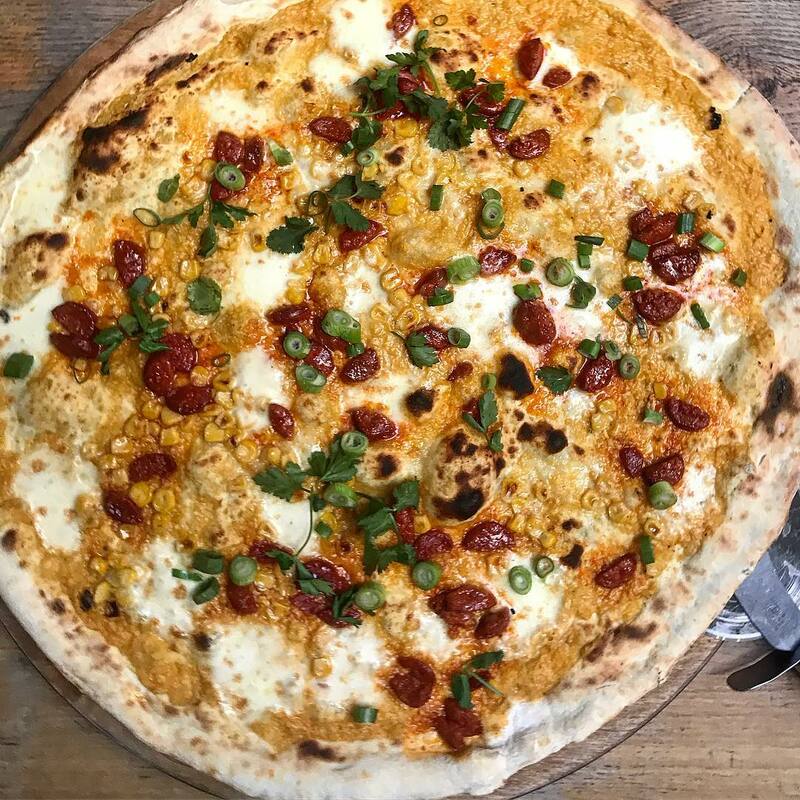 London's finest wood-fired pizzas may be a title every pizza joint is after - but if any place deserves it - it's Basilico. The pizza menu is simple, but that's all part of the point. 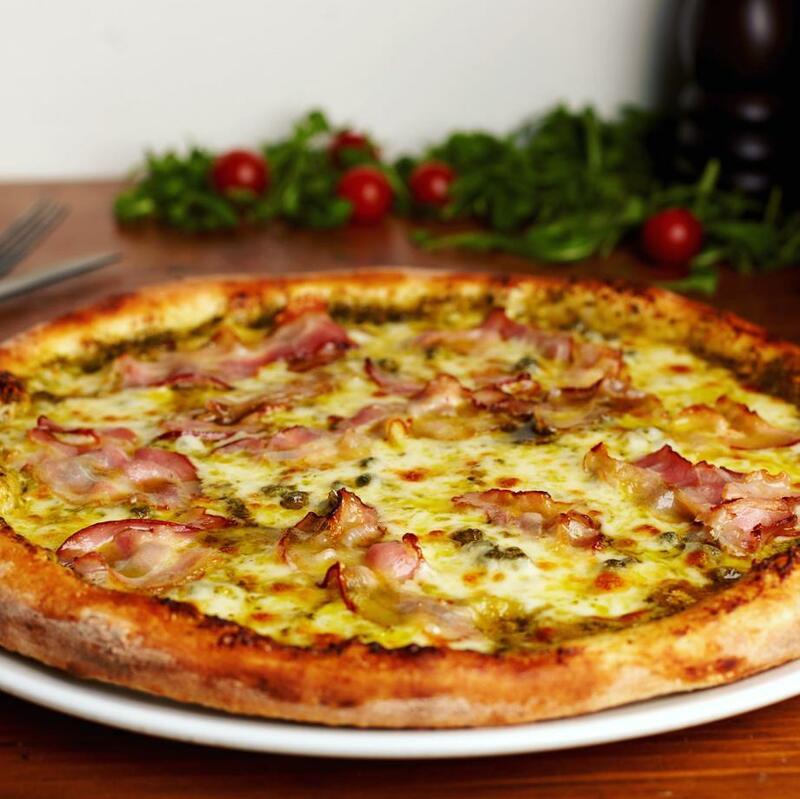 For more than 20 years, Basilico have prided themselves on creating pizzas that combine the traditional Italian method of preparation with innovative flavour combinations and only the freshest ingredients, making it a City Pantry favourite. But don't just take our word for it. You have to taste it yourself to believe it. Ever tasted a Michelin-starred pizza? Well, now's your chance. 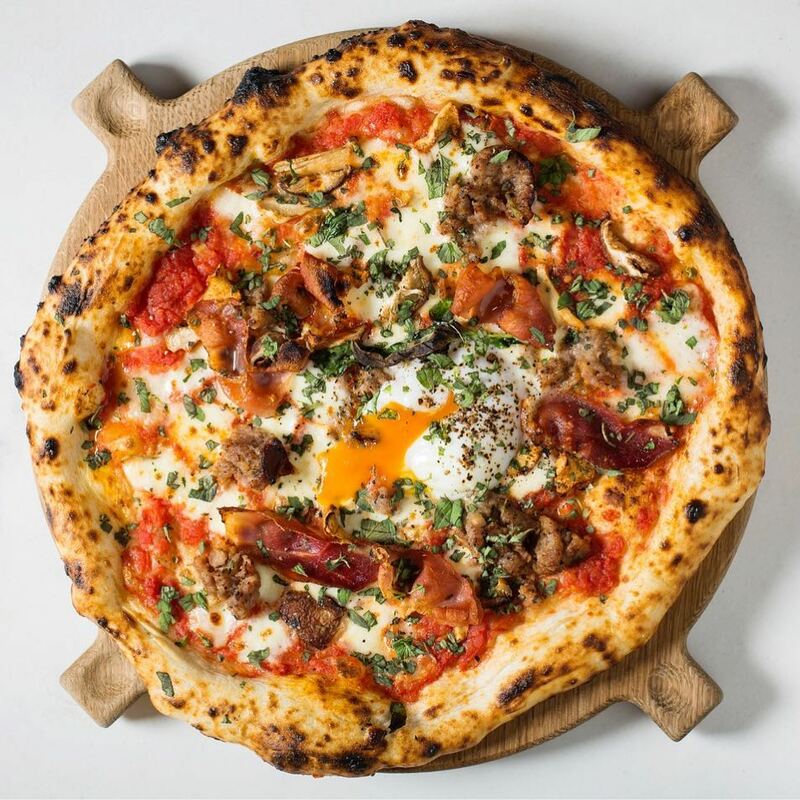 Hai Cenato - the brainchild of Michelin-starred chef Jason Atherton - serves pizzas with clever and creative toppings on some of the most inventive sourdough bases in London. So for a Friday pizza that's a little bit more luxurious than what you're used to, try the pizza topped with speck, n'duja, spinach, anchovy and harissa for a flavour bomb of a pizza that will make the rest of your day fly by. Serving creative topping combinations with their secret blend of herbs, Joe and 'Za are a surefire success. With a modest menu compared to some of other pizza joints, each pizza is crafted with the upmost care. Take their 12-inch Pollo di Zucca pizza, with Fior di Latte cheese, pumpkin paste, smoked chicken, mushroom, spring onion, thyme, olive and Roquito peppers, this is an autumnal feast of a pizza that's a perfect lunch when you can't tear yourself away from your desk, delivered direct by City Pantry. Some pizza places are all about the toppings. Or the size. Or the crust. But it's the dough that really sets Amici Miei apart. They take as much care as humanly possible with their dough, using a slow-rising process that lasts more 72 hours. And the result? A traditional-tasting pizza slice that's light on the faff and heavy on the flavour, every single time. Whether it's for lunch, weekend-working or as the main event for after-work drinks, sometimes you just need a pizza delivered to your office. And the best part about ordering pizza through City Pantry? You'll never pay more with us. Even if you go direct. So if you want to see all the pizza available for office delivery in your area? Start here.